Becker is a well-known brand among accountants who want to pursue CPA in the US. 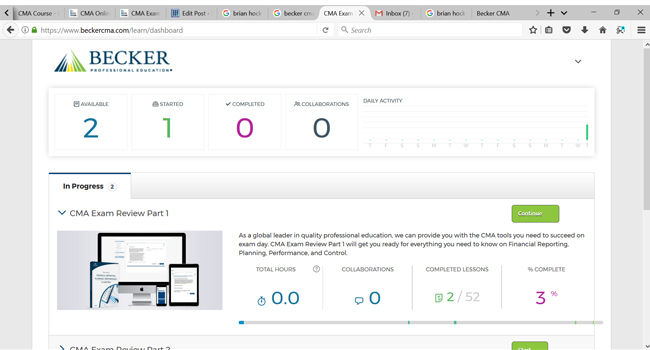 Becker discontinued its CMA review course in 2006, but 3 years ago the company relaunched a new self-study course and live classes through international partners. The encouraging news is that Becker CMA finally introduces a 14-day free trial. If you are interested or that your employer is willing to sponsor the Becker CMA course for you, it’s good to take a look and compare the offering with the competitors. Gleim and Wiley also have free trials that you can sign up without strings attached. I signed up for the free trial. As you see below, it has a nice clean layout with a basic progress stats and chart. Becker CMA does have one of the longest access period for the online practice questions — 24 months. From what I know, Becker CMA Review is not a product of Becker. It is simply a reseller of a product developed by Power Resources. Update (Oct 2017): I notice that “Power Resources” is no longer mentioned on the Becker CMA website or in the free trial that I sign up for. Instead, I see a familiar face — Brian Hock from Hock CMA as the instructor. Can’t be 100% sure because the instructor doesn’t introduce himself, but it’s the same exact look, voice and even the same white shirt that you may see in some Hock youtube videos. Looks to me that they slap existing Hock course into Becker’s under some sort of agreement. Hock is a much better partnering choice in my opinion, but as a consumer, why wouldn’t I go for Hock for a lot less? Although the online platform is light weight and seems to run fast on the internet, it lacks a few important features. For example, the study plan is simply one PDF file with a suggested time table. This is far below the standard when interactive and personalized study planners are quite common nowadays. The practice questions are not presented in a simulated exam environment (i.e. it looks different from the one you will see in the real test). This is almost the most basic feature in other online courses. There is also no audio review and no money-back guarantee. Given the limited offering, it is surprising that Becker CMA is now priced at a higher level than the premium Gleim CMA Review System. I understand the Becker is always priced at a big premium for their CPA product, but that’s different because of the history and reputation. It just doesn’t seem to make sense why I have to pay more for a seemingly inferior product for the CMA exam. In 2014, I sent an email to Becker, hoping they will shed some light on their product offering. I specifically mentioned that I am a blogger of a CMA exam prep site and would like to get this info on behalf of my readers. Thanks for contacting Becker Professional Education. You submitted your email as a Blogger. Becker only allows authorized Becker agents to promote Becker products. Therefore, the only information I can provide is the information listed on our website. If students are looking to register and submit these questions directly asking for specific information I can and will provide a direct answer to their questions. If you would like for me to submit your information to our marketing team for the approval to promote our CMA course on your website, I will be glad to do so. Thanks for you understanding, and I do apologize that my first email did not clearly state the above. The lady is courteous, but I don’t appreciate that I need an approval from Becker to talk about their product on my blog, and their assumption that I wanted to promote their product. This was 3 years ago. They finally have a product description on their website and offer a free trial, so things seem to have improved. In terms of customer service however, I haven’t got or heard anything that would change my mind of their institutional (impersonal, inflexible and unhelpful) style. The product and customer service hasn’t been impressive. For now I do not list Becker on my major CMA review course page. If you are new to the CMA exam, there are several well established, family-run and caring review courses out there, as shown in the chart above. Check out my comparison page on major CMA course providers. Can I be More Helpful? If you are about to start your CMA journey, I am happy to help you out! Feel free to subscribe to my free mini course, to be delivered to your email for 7 days. You may also want to get the details of this mini e-course here. I want to know that is Becker’s study material is good for CMA US now or not??.. Unless they provide the basic information, I won’t be able to tell. In my own opinion, their action implies that they are not (yet) confident of their product; as if, if they fail, they can just tell people that they are only in trial mode. Again, this is only my speculation. I haven’t been able to verify anything from Becker. Hello, I would like to share my experience with Becker. On 5th or 12th Dec’15 either of the two mentioned Saturdays I went to attain a demo class conducted by Eduprinstine,channel partner of Becker in India. The demo session was held in Hyderabad. The study material what I have seen other student using was not at all up to the mark. Point no 2, they have their own set of study mat on the basis of which classes are conducted. Though, the classes are informative and the faculty doing her level of best to catch up to the course requirement, but, I personally think to clear CMA, we need much better sessions. The examples are not at all descriptive as concluded by me through a glimpse of the material. I personally would prefer Hock, Gleim or Wiley. Becker’s actual material I have not yet seen. Moreover, neither do I have noticed MCQs or question bank of Eduprintine,but, overall I am not at all impressed and would suggest others to think twice before investing,cause, CMA is after all not only a challenging and life changing qualification, it’s also very expensive. Any further review on Becker? I also have it, but have not taken the exam. I want to know if i should allocate my time more towards the reading, or the practice questions. Their website remains to provide minimum transparency and I haven’t heard of other readers using Becker CMA, so I am afraid this is all I have, for now. It would be nice if you share your thoughts as well. In general, it is better to focus on practice questions, especially towards the end. Do you have a live instructor for your course? You can ask for his/her advice as well. I do not have a live instructor. I have focused on the practice questions for the majority of my time spent, and their practice questions come from IMA past exam questions, as well as additional questions they have made. I will go further into Becker review after my exam dates. Additionally, i think there needs to be more transparency in first time pass rates with English as their first language, and education background. On a global level the 40% pass rate is very scary stat upon first glance, but when dissected its understandable. Hello, thanks for your note. Yes, you are on the right track. Best of luck to your exam and do tell us what you think of Becker CMA afterwards. On the pass rates, there used to be a breakdown of pass rates by region, which pretty much differentiate the English speakers from the non-English speakers. Just got my results, and i passed with 410/500 on the first part. Becker was sufficient, but i think my education i got from UKY served as a good beginning, and becker was a light refresher for the material. Hi Kameron, congrats to you, and thanks for the sharing! I am now studying for the CMA exam part one , my exam in three weeks , I have studied Becker Material and questions, but are they enough .I have been solving Gleim questions , and there are many topics and questions , that are barely mentioned in Becker, and in Gleim questions are covered on a broader basis . Hi Haneen, quite frankly, if you don’t see the topics covered in Becker, take that as a warning signal. I would definitely spend the rest of the three weeks working through the Gleim questions. I m a student of bcom 2year can you suggest me that for which part I should go first I m so confused in this thing…! Hi Priyank, if undecided, you can always go with the default, i.e. start with Part 1. Otherwise, you can pick the one you are more interested in / more familiar with. And here is Kameron saying he passed studying only Becker, do I have enough time to study all over again ?! Hi Haneen, Kameron did say he has a relevant background, so you need to determine whether that applies to you as well. do you have recommendations for me concerning the essay questions ?! In India, options for review courses are limited. I have 2 options i.e, Wiley & Becker. Please suggest which one to select & will it be sufficient to clear both the exams? hey I’m using Becker and I plan to give my part one exam next month can you please help me with this , I want to know that are the practice questions asked by Becker are of the same type that are asked in the main exam . is it enough if I go through only the material provided to me by Becker ?